This recipe was created on Easter Sunday. I did not want to eat the traditional foods that are normally served on Easter because Ham and the sides tends to have a lot of carbs, fat and sodium in it and there are consequences for me when I eat foods with too much of these things. This is an excellent dish as a meal or a side. This was one of the recipes that are vegan/vegetarian friendly. 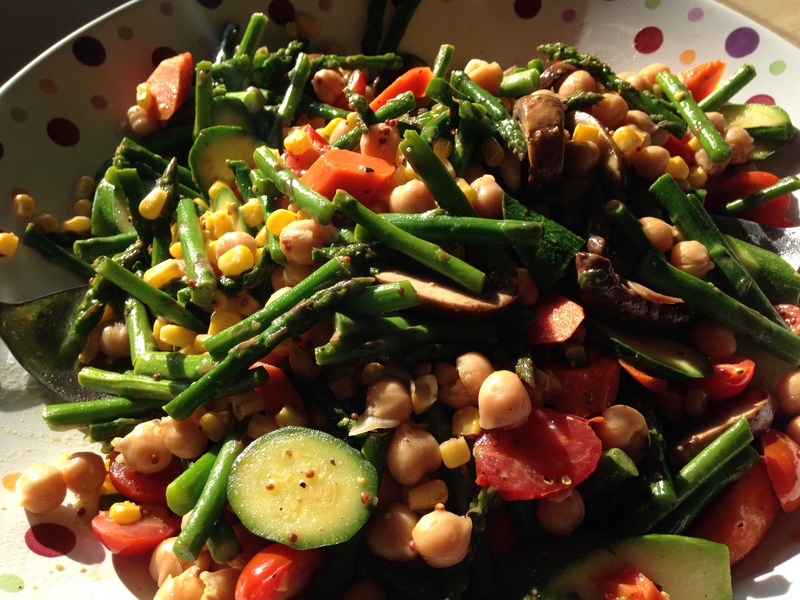 I used my favorite vegetables and beans for this sautéed stir fry dish. Enjoy! Put all the ingredients in the jar, shake well and set aside. Heat about 3 tablespoons of vegetable stock in a wok over high heat. This process will go very fast. Remember to season each batch of vegetables with salt and pepper suited to your taste. Sautee the carrots for about 5 to 7 minutes; you want the texture to be medium soft and remove and transfer to the serving platter. Then add about 2 tablespoons of vegetable stock and the mushrooms and cook for an additional 3 to 5 minutes, remove and transfer to the platter. Add more stock as needed and continue to cook the zucchini, asparagus, and green onions for additional 3 to 5 minutes and add to the vegetables previously added to the platter. 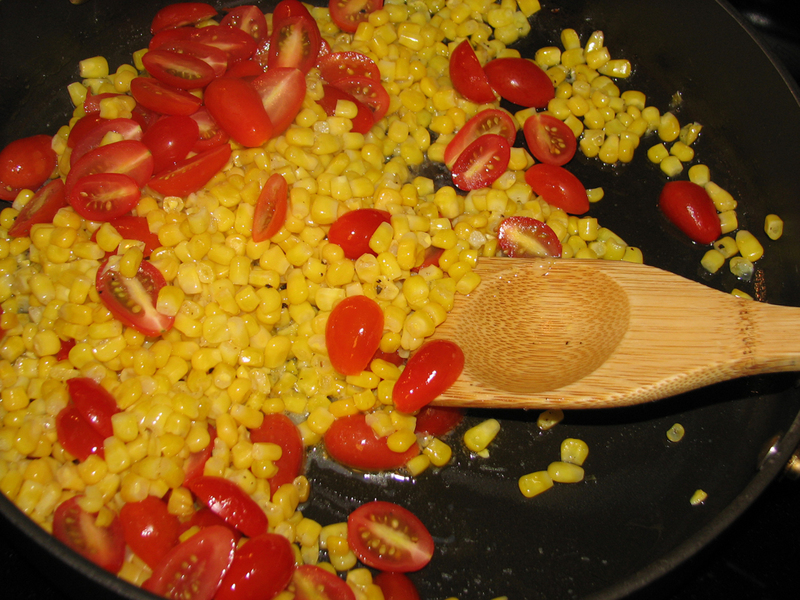 Add the corn, tomatoes and garbanzo beans until fully heated through and transfer to the serving platter. Sunday was the first day of Daylight Savings Time. The day was a gorgeous, crisp and sunny fall day. Drove around doing errands and showing my friends around Columbus. They wanted to visit the Whole Foods on Route 161 in Dublin. Awesome Store! I had researched earlier on the internet for recipes for the week and to prepare for my dinner party on Wednesday and came across a blog called detoxinista.com and saw some recipes I wanted to try. This one is similar to what we know as Broccoli, Rice and Cheese casseroles. I remember my mom making this with Cream of Celery Soup, frozen broccoli, lots of cheese and white rice. Now that I think about it, ick! I made this recipe and tweaked it some to suit my tastes and was it was amazing! This recipe has no dairy or cream of “something” soup. Tasted just like the real Broccoli and Cheese Casserole. I wish I can take credit for this recipe but I cannot! Most Excellent! Preheat the oven to 350 degrees. To cook the quinoa, put water and rinsed quinoa in a pan, bring the water to a boil and add the quinoa. Cover and simmer for 15 to 20 minutes until all the water is absorbed and the quinoa was plumped up. Fluff with a fork gently and set aside. While the quinoa is cooking, in a large sauté pan, on medium high heat, add the oil and onions. Sauté for about 5 minutes till the onions are translucent (shiny) and tender. Add the broccoli florets and 2 tablespoons of water to the sauté pan and mix well. Cover and steam the broccoli for about 10 minutes until tender but not mushy. In a blender, in order add the water, mashed sweet potato, nutritional yeast, salt, onion powder and chili powder until creamy and smooth. Combine the quinoa and sautéed vegetables in a large bowl and add the sweet potato cream and combine well. Spread in a large casserole dish or deep dish stoneware. Bake for 10 minutes until bubbly and hot. I cooked mine for 45 minutes and the top was a little bit dark but I think it deepened the flavor. Serve the casserole with a Green Salad. I had a very busy day today and by the time I got home it was very late. I was starving but did not want to get take out. This recipe has all the healthy vegetables I love and I decided to do a fast broil and stir-fry. The whole dish took no longer than 30 minutes to cook. Love the fresh flavors and I am addicted to tomatoes broiled with melt cheese on top. A great recipe that is fast and healthy. Enjoy! Prepare the pasta according to the package directions. Preheat Broiler on low heat to prepare for the “Broiled Tomatoes”. Click here to see the “Broiled Tomato” recipe used here. In a sauté pan over medium high heat, heat up 2 tablespoons of olive oil. 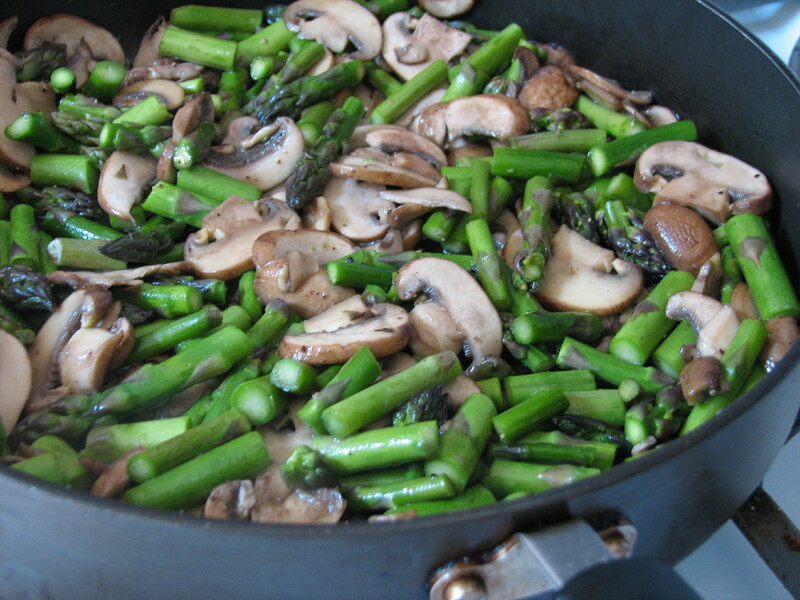 Sauté the mushrooms for approximately 5 minutes and add the chopped asparagus to the pan. Continue to sauté for another 3 to 5 minutes until asparagus is heated thoroughly. The asparagus should have some bite to it and not soft and soggy. 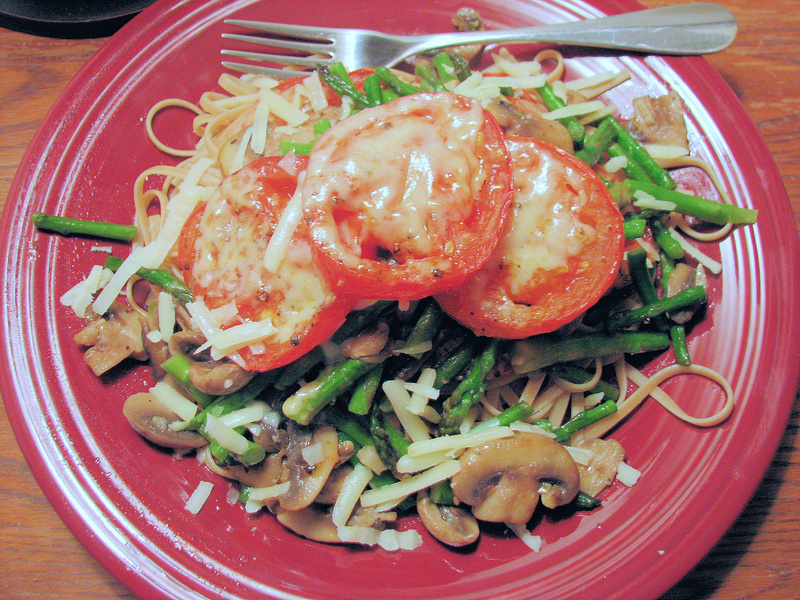 On a plate, layer with pasta, 3 tomato slices, asparagus mushroom stir fry, 1 tablespoon of Parmesan cheese and 3 more tomato slices on top. I had quite a few vegetables left over from this week and my creativity did not kick in on this Sunday morning. I just felt so blah from my work week and did not know what I wanted to eat for breakfast. I basically threw the leftover asparagus, mushrooms in a sauté pan and cooked them for a few minutes, made fresh spinach pesto and scrambled up some eggs. Voila! A healthy green breakfast that screams I Do Like Green Eggs says Pam I Am! Needless to say I felt better after I ate and drank 2 cups of coffee. In a food processor add the baby spinach, garlic, and Parmesan cheese pulsate until combined well. With food processor running, add the olive oil until reach desired consistency –pesto should look like thinned paste. Spoon the pesto over prepared dish. 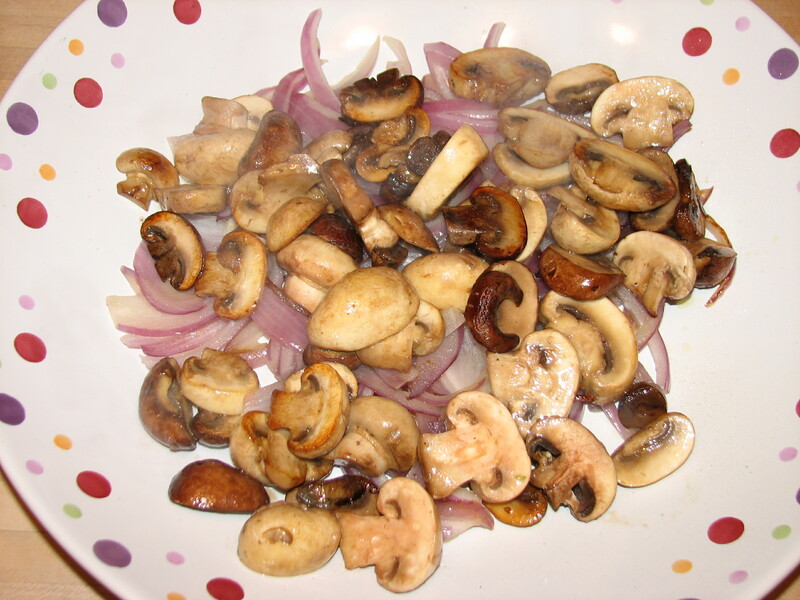 In small sauté pan heat up over medium high heat olive oil, add sliced mushrooms sauté for about 2 minutes. Add the asparagus and continue to sauté for an additional 3 minutes. Remove from heat and set aside. In another 10” sauté pan, melt the butter over medium high heat, add the beaten eggs and with a wood spoon stir eggs until cooked and scrambled. Remove egg from heat and sprinkle Parmesan cheese evenly over eggs. 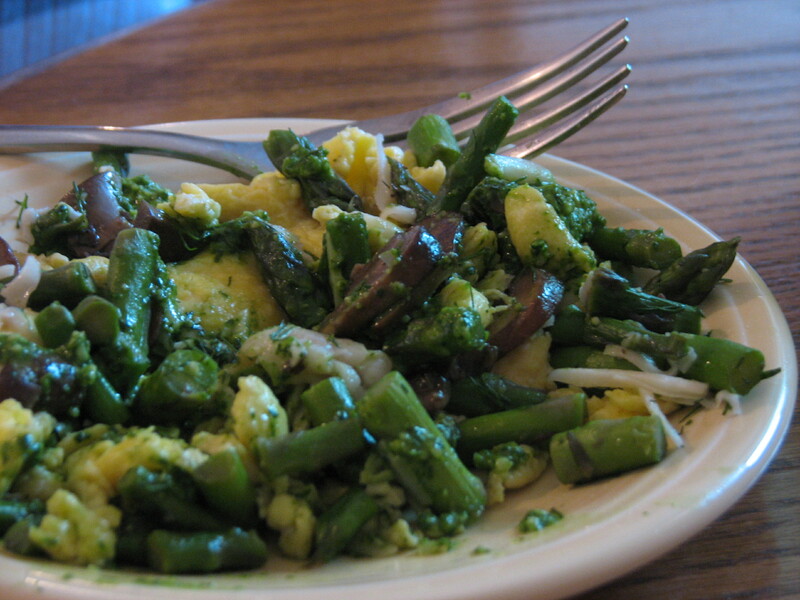 Spread vegetable mixture over eggs and then drizzle the eggs and vegetables with spinach pesto. Enjoy! I was invited to a barbeque potluck recently and wanted to bring something that I would not have to worry about spoiling when sitting out in the warm weather for a long time. I visited the local farmer’s market in Worthington, OH and took advantage of their wonderful spring vegetable picks for my recipe. 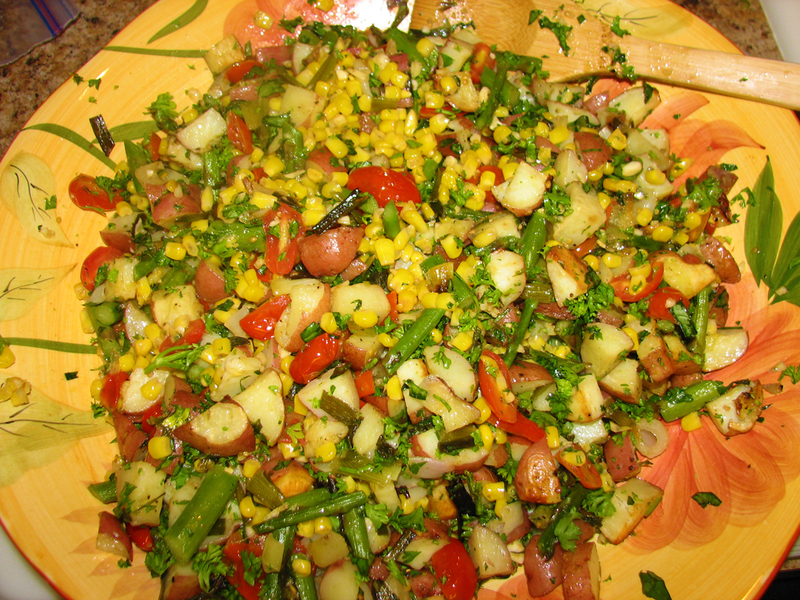 Fresh herbs, asparagus, baby red potatoes, spring green onions, and garlic were all a part of my creation for this dish. The results were amazing and there was just a little tiny serving left after the night was through. Enjoy! In a large bowl, combine green onions and potatoes with about 3 tablespoons of olive oil and season with salt and pepper, coat well and spread single layer on a cookie sheet or stone. 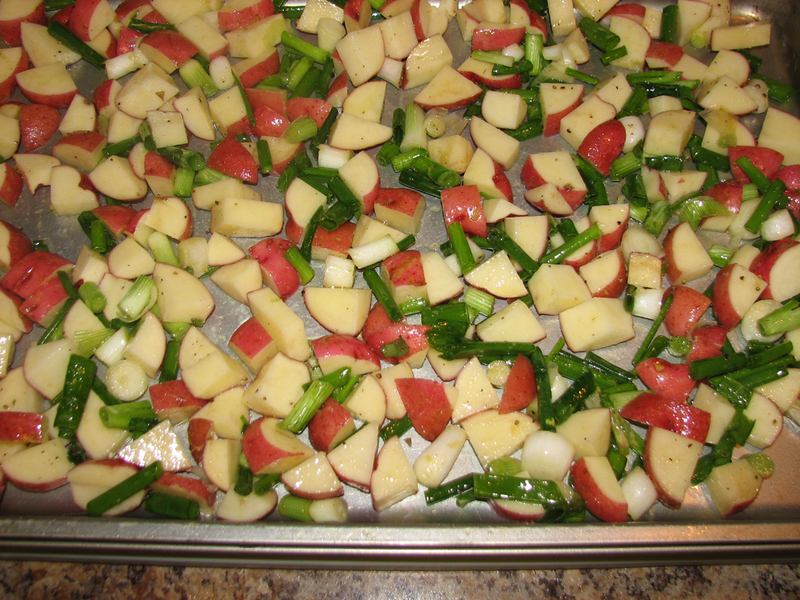 Put in oven @ 425 degrees for about 20 minutes until vegetables are soft and golden color. 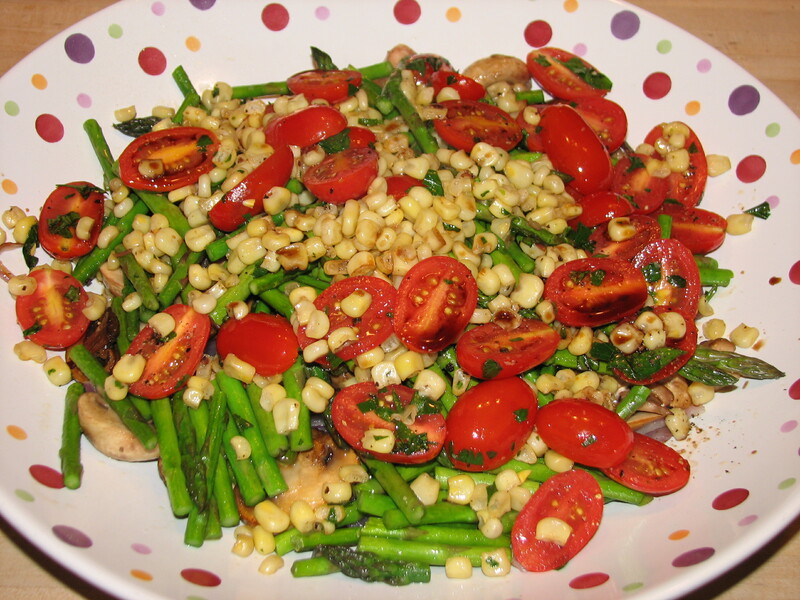 Put cut asparagus in a bowl and coat with approximately 1 to 2 tablespoons of olive oil, season with salt and pepper. 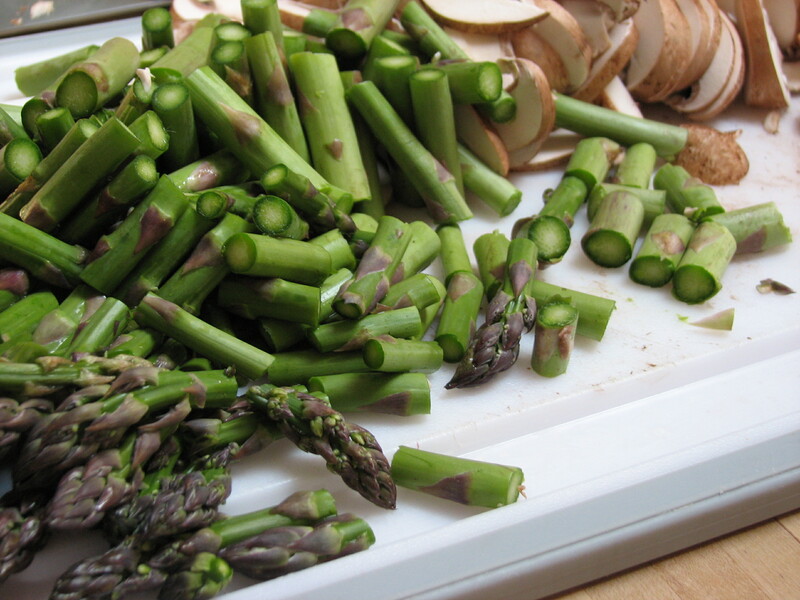 Put asparagus single layer on a cookie sheet or stone and place in oven for about 15 min or less. Put the cut corn in a sauté pan with about ½ tablespoon of olive oil, halved tomatoes and minced garlic, season with salt and pepper. Sauté for about 5 to 7 minutes or until tomatoes shrivel a little. Remove from heat and put in a large serving bowl and top with fresh chopped basil and parsley. Put roasted red potatoes and asparagus in bowl and toss well. It is possible you may have to add another tablespoon of olive oil (optional). Season dish with salt and pepper as needed. I had a garden this year and I was disappointed that summer was over because I knew I was not going to get all the wonderful fresh vegetables that I love. I made my “End of Summer Tribute Salad”. I made this salad for some friends that were coming over to play scrabble and it was a hit. Love this salad and I will make this often. Enjoy! Salt/Pepper each layer to your taste. Remember to keep the salt content down to give it on the healthy side. This is a very fast recipe – the cook time is no more than 5 minutes per vegetable, make sure you stir the vegetable batches often. You will cook each vegetable separate in batches. I did this way because different vegetables cook differently and I wanted to make sure that they vegetables stayed on the crunchy side except for the onions. 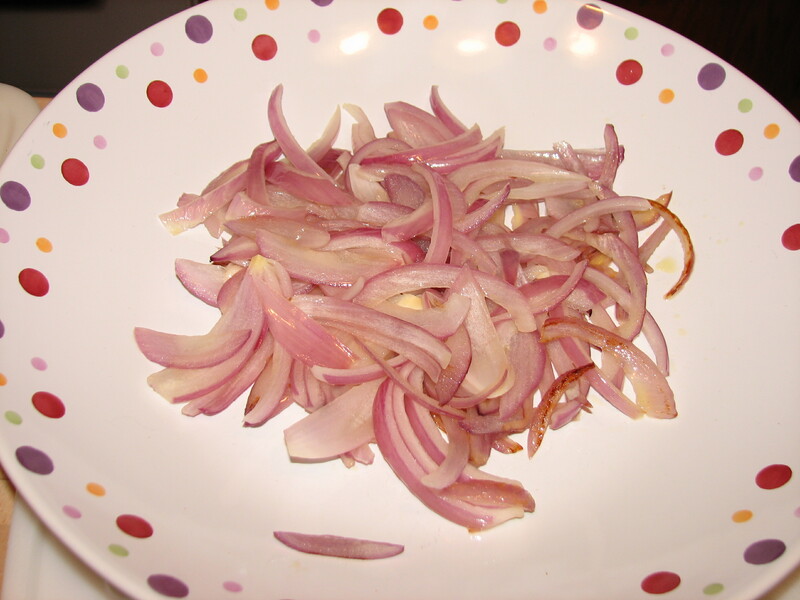 I caramelized the onions to make them sweeter. In a large 12” skillet, heat up 1 tablespoon of olive oil and add the onions. Cook for about 5 minutes until the onions are brown and soft. Transfer to a decorative large serving bowl. This will go in layers. Add 1 teaspoon of olive oil to the hot skillet, and add the mushrooms. Sauté the mushrooms for about 3 minutes, you will still want them to keep their shape but cooked like half way. Transfer to the serving bowl and layer on top of the onions. Add 1 teaspoon of olive oil to the hot skillet and add the asparagus. Sauté the asparagus until heated thoroughly about 2 – 3 minutes, I wanted to make sure the vegetables stayed crunchy but hot. Transfer to the serving bowl and layer on top of the mushrooms. Add the corn and parsley to the hot skillet. No oil is needed. Sauté the corn and parsley for about 2 to 3 minutes until the corn is heated thoroughly. Then transfer to the serving bowl on top of the asparagus. Add the halved cherry tomatoes to the hot skillet – this is very fast, just enough time to heat the tomatoes thoroughly about a minute – stirring constantly. Transfer the tomatoes to the serving platter on top of the corn and parsley mixture. Add the balsamic vinegar to the sautéed vegetables and toss well. Taste and season the vegetables for the last time to your taste buds. Enjoy! 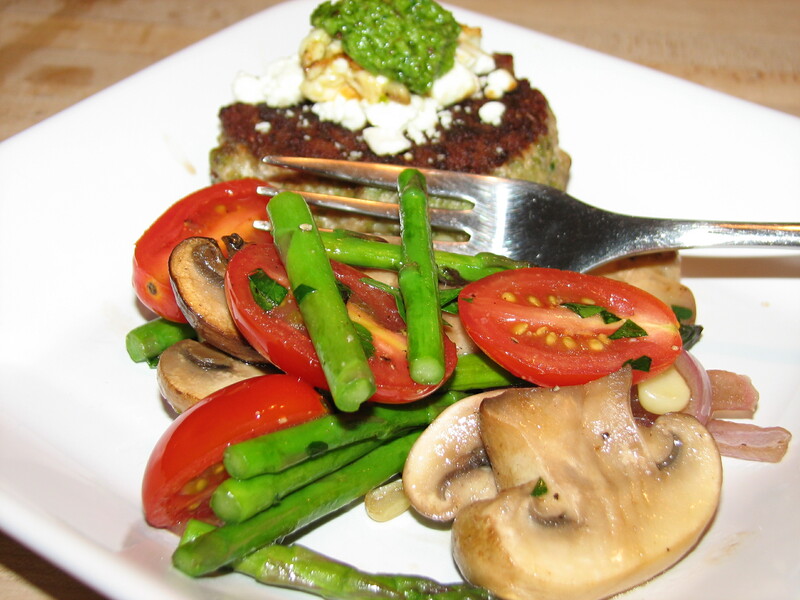 The vegetables can be served over cooked Quinoa or Farro. A simply healthy amazing tribute to summer! I had family coming up for the weekend and wanted to make Brunch. Since I started experimenting with Frittatas I wanted to try the same thing but with an added vegetable. 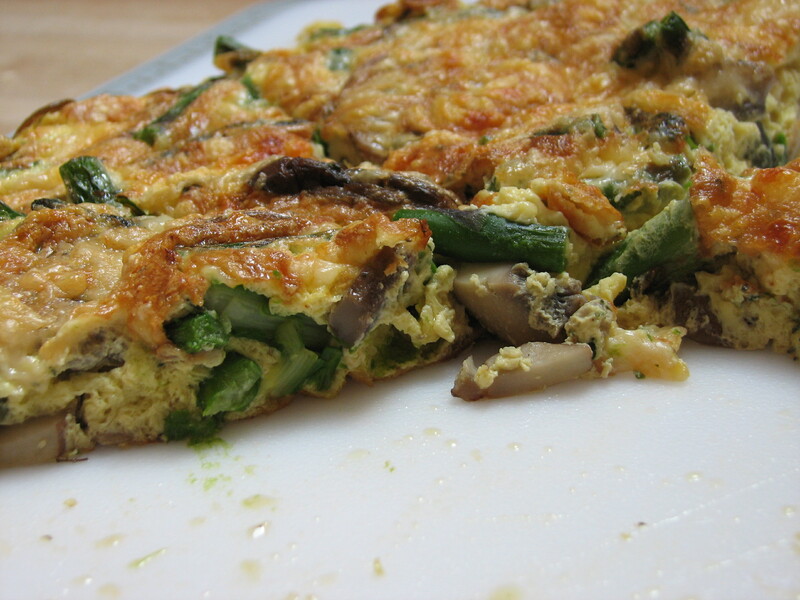 Michigan Asparagus is in season and I decided to add it to my Mushroom Frittata recipe. The results were perfect. In a 10 to 12” large non-stick skillet, heat up olive oil. Add the sliced mushrooms and sauté for a good 5 to 7 minutes until some of the mushrooms have shrunk in size. 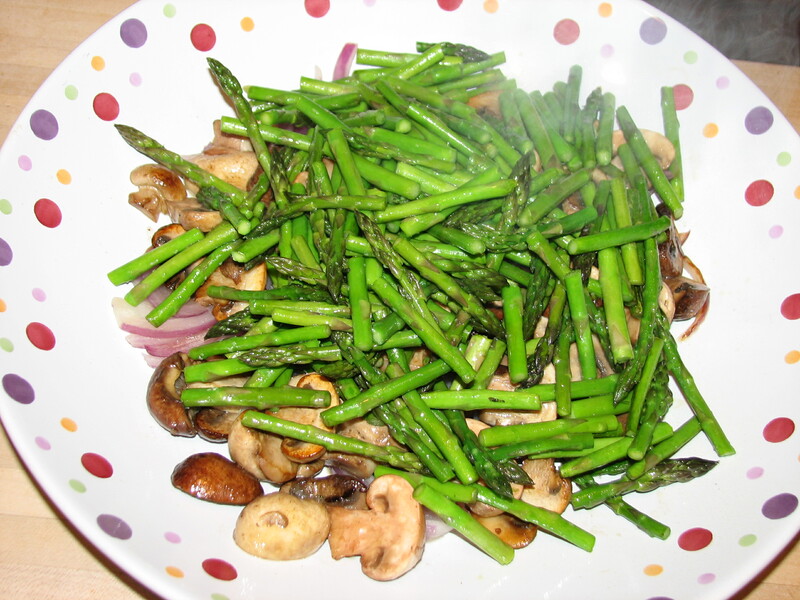 Add the bite size asparagus to the mushroom mixture and sauté for approximately 3 to 5 minutes – you want the asparagus to still have a nice crunchy bite and not be soggy. Season with salt and pepper to taste. Add the egg product or eggs, and cook over medium high heat. Add about ½ cup of the grated Parmesan cheese and the minced thyme and very lightly, using the back of the wooden spoon push the cheese and thyme into the egg mixture. Do not scramble the egg. Just let the mixture sit there cooking and cover with a lid for approximately another 5 minutes. Remove the lid, sprinkle the balance of the cheese on top and put the skillet into the broiler for another 5 minutes until the top is golden brown and the center of the frittata is set. 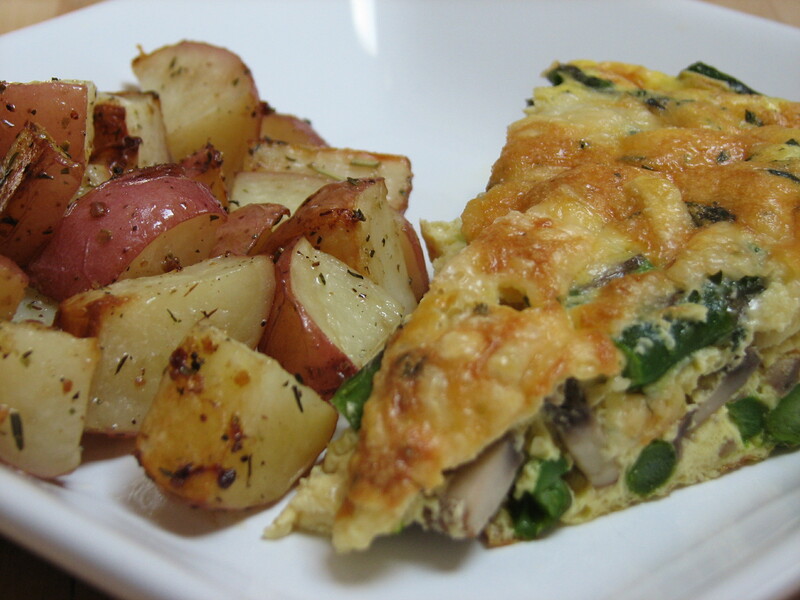 Remove from the broiler, and slide the frittata out of the skillet onto a cutting board and cut into even slices. Serve with whole grain toast with homemade jam or roasted rosemary red potatoes. Enjoy!